Prior to 1870, the twin ports harbor was mainly limited to Superior. 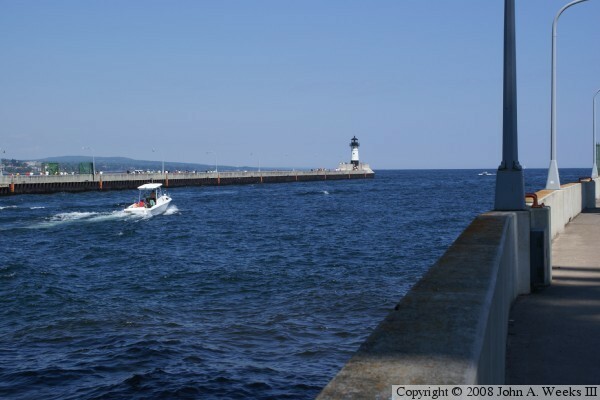 At that time, only shallow draft boats could enter at Superior and travel to the landings in Duluth. Duluth investors funded cutting a canal across Minnesota Point in 1871 to allow ships to have direct access to the Duluth Harbor. Superior opposed losing their harbor monopoly and went to court to stop Duluth from creating a harbor entrance. Superior was granted an injunction to stop the project, but before the injunction could be served, the investors rounded up a large group of men and finished digging the canal over a weekend. 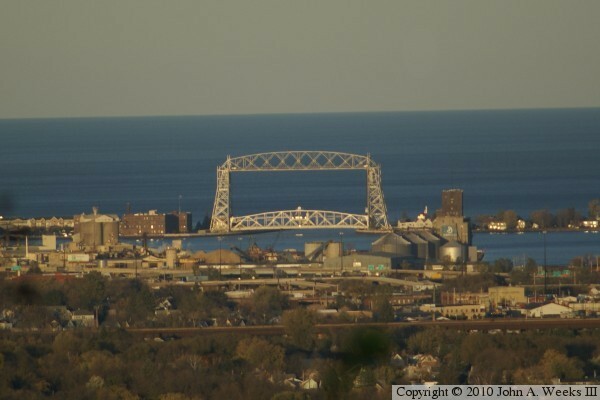 This canal is known as the Duluth Ship Canal. The new canal left Minnesota Point residents without land access to the mainland. A crude suspension bridge was placed across the canal in winters in the 1870s, but that did not solve the problem year around. To address the problem, a bridge was built in 1904 and 1905. 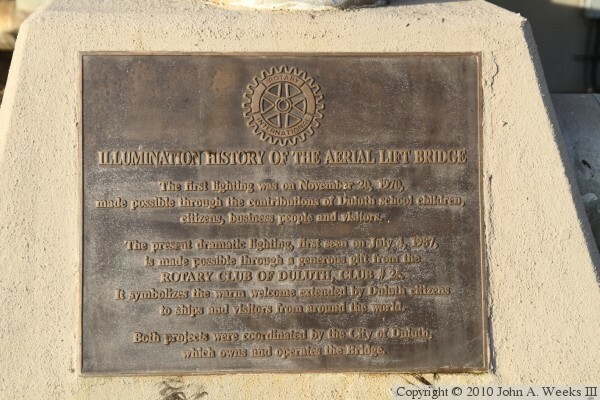 The bridge was a very unusual type called an Aerial Transfer Bridge. It features a shuttle car that crosses the canal. The shuttle car could hold cars, buggies, horses, street cars, and up to 350 people. It took a minute to make the crossing, and the shuttle crossed every five minutes. The shuttle itself hung down from the huge upper truss structure via cables. 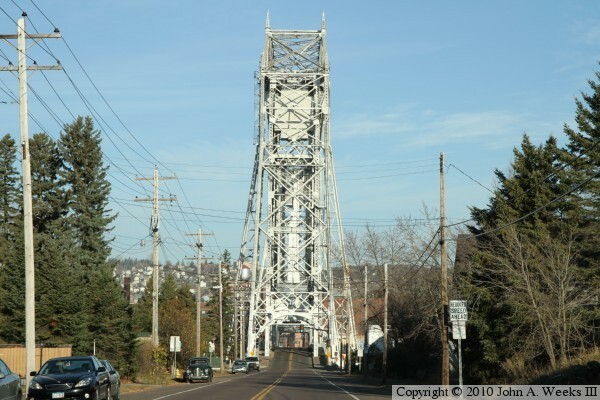 That explains why this lift bridge has that huge upper truss, something that is not found on many other lift bridges. While the transfer bridge was successful, it did not handle automobile traffic very well. The delays grew to the point where something had to be done. In the years 1929 and 1930, the shuttle was removed, the bridge was raised higher (to accommodate newer taller ships), and a lift span was installed. When in the down position, the lift span could carry vastly more automobiles per hour. Traffic problems at the Aerial Lift Bridge again became an issue in the summer of 2010. 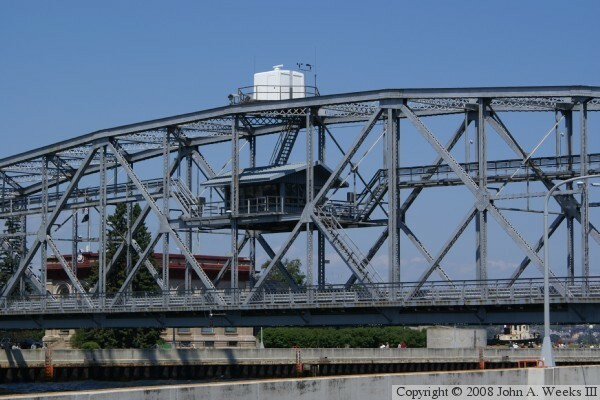 Traditionally, the lift bridge would operate whenever a boat needed to enter or exit the harbor. However, residents have become increasingly vocal about traffic problems getting onto and off of Minnesota Point over the previous decade as Canal Park became an increasingly popular tourist destination. While the bridge has a year around traffic average of around 7,000 cars per day, that traffic is highly seasonal, with peak summer volumes of over 15,000 cars a day. 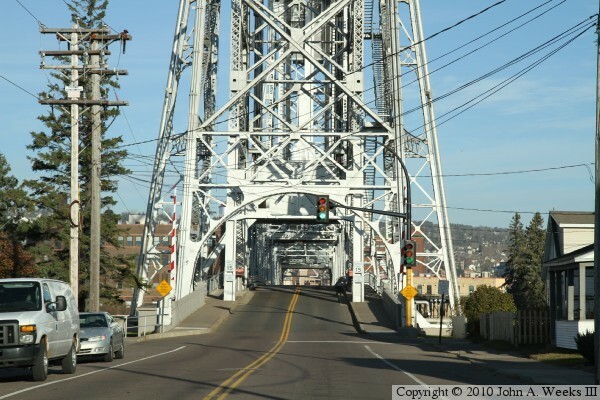 The city of Duluth has proposed opening the bridge on a schedule every 30 minutes. Tour and charter operators, however, complain that will hurt their business, possibly forcing them to relocate to Superior. 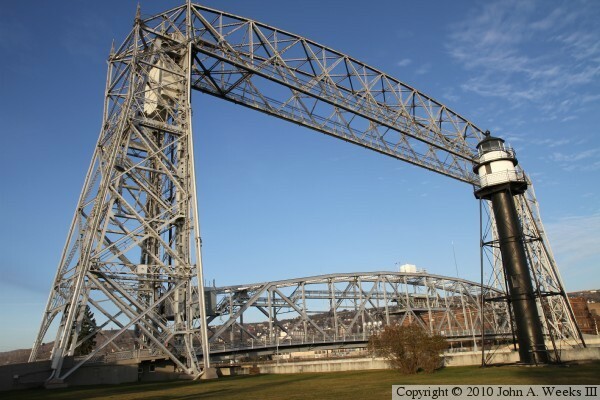 The Aerial Lift Bridge was added to the National Register of Historic Places in 1973. 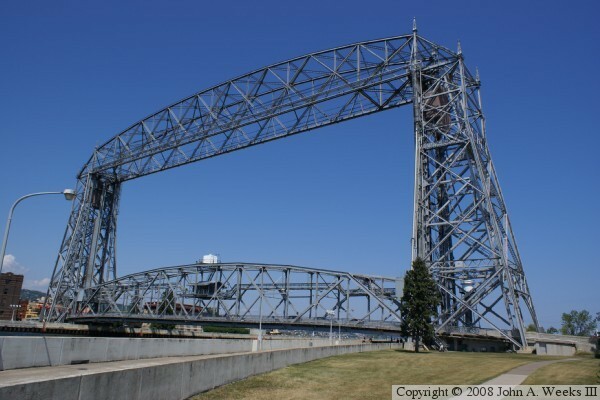 Over the winter of 1999 and 2000, the Aerial Lift Bridge was given a major overhaul. This included replacing much of the deck, replacing the cables, and repainting the structure. As an aside, the land that was used for the Duluth Ship Canal was owned by Wilhelm Boeing. He moved from Duluth to Seattle, where his son William founded the famous aircraft company. 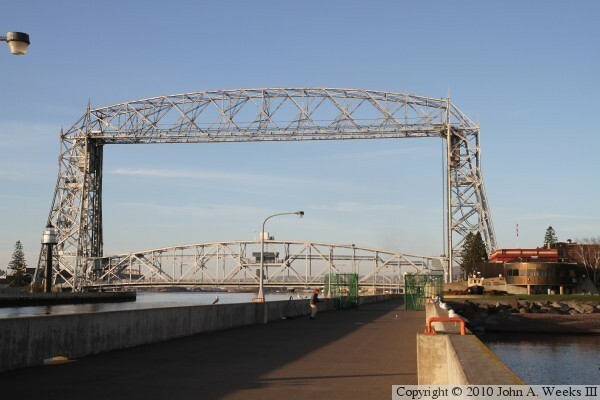 The photo above is a view of the Aerial Lift Bridge as seen from the southwest corner of the Duluth Ship Canal. 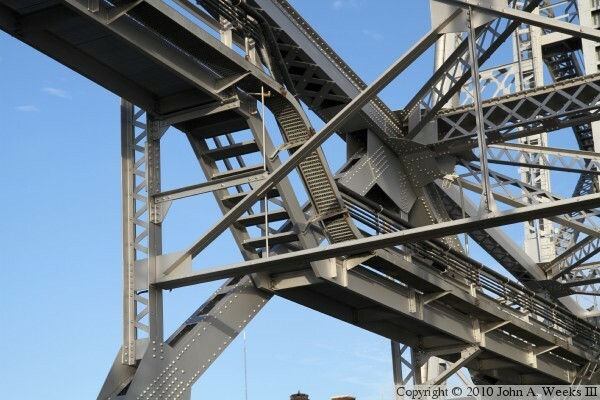 The photo above is a close view of the movable truss span. 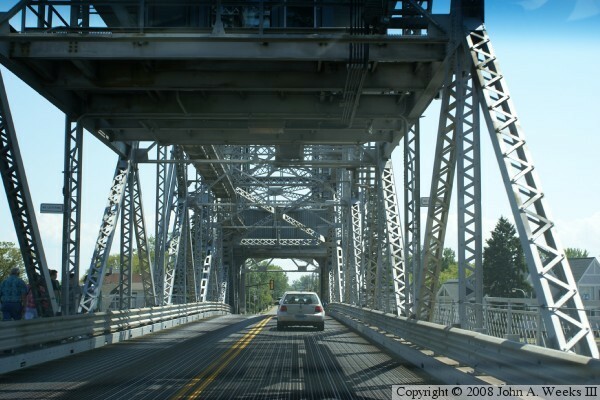 The structure in the middle of the truss span houses the bridge operator. 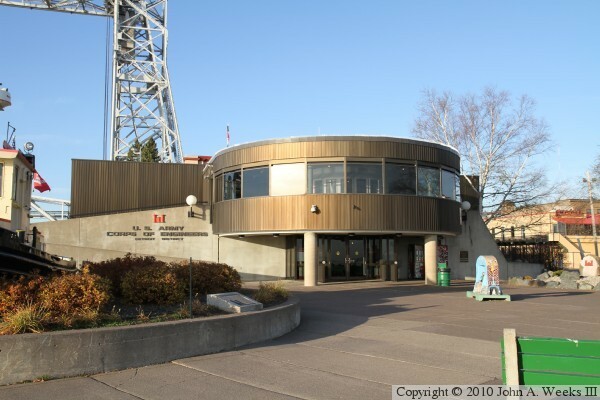 The white structure on top of the truss houses a radar and weather station. The photo below is a view of the southwest bridge abutment. 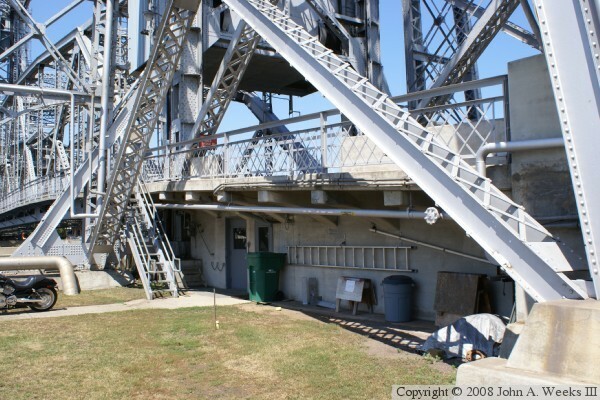 The stairway on the left side of the entrance doors leads to the walkway to the bridge operator house on the lift span. A mechanical room is located under the bridge deck. These two photos are the first of a four photo set showing a typical bridge crossing heading south on Lake Street towards Minnesota Point. In the photo above, we are a block from the bridge. In the photo below, we are approaching the north tower of the bridge. The line of automobiles was backed up waiting for the bridge to reopen after a lift cycle. 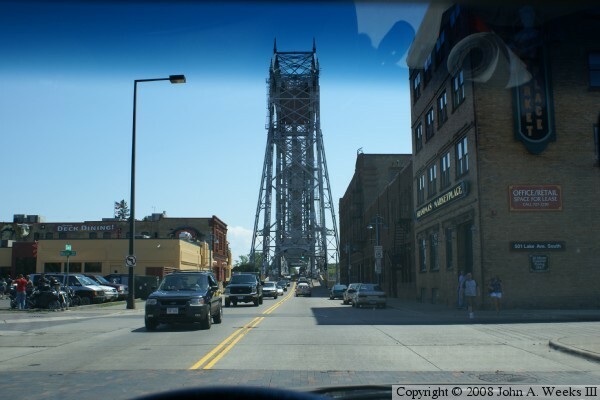 These two photos are the final two photos of a four photo set showing a typical crossing of the Aerial Lift Bridge. In the photo above, we have just entered the north end of the bridge deck. In the photo below, we are nearing the south end of the bridge deck. 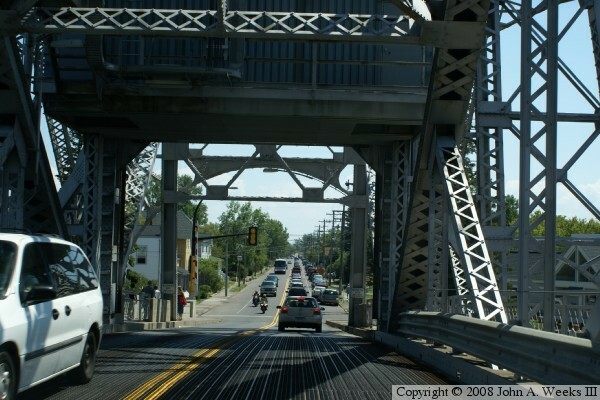 The small incline that raises the deck above the street level allows us a good view of the line of cars in front of my vehicle, all of which were backed up waiting for the bridge to cycle prior to being able to cross the structure. 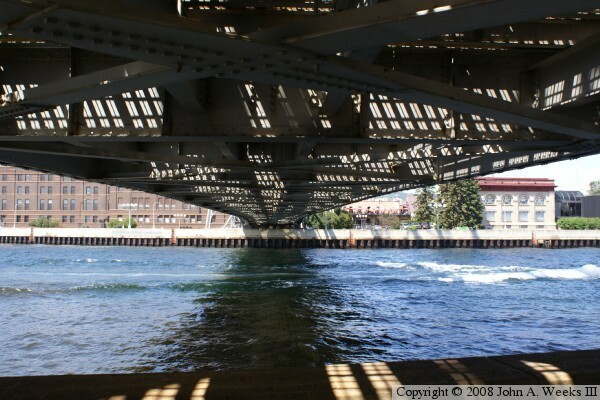 The photo above is looking north across the ship canal from directly under the lift span. The open steel deck and metal truss structure results in an interesting pattern of light. The photo below is looking east down the ship canal towards Lake Superior. 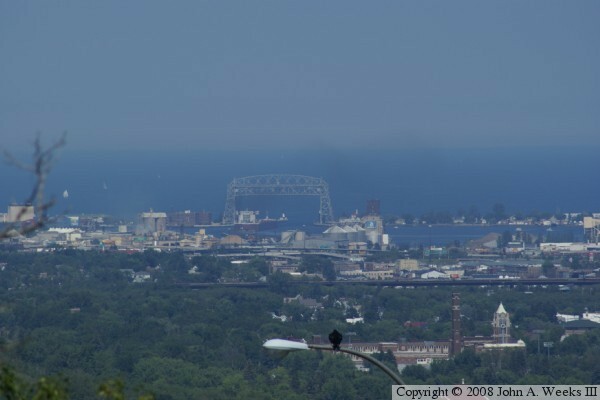 The photo below is a view of the eastern section of the Duluth Harbor and the Aerial Lift Bridge as seen from high over the city on the bluffs along Thompson Hill. Note that the lift bridge is in the up position as a freighter passes through the canal. The photo below is late evening view from the same vantage points as shadows from the bluffs creep across the city. 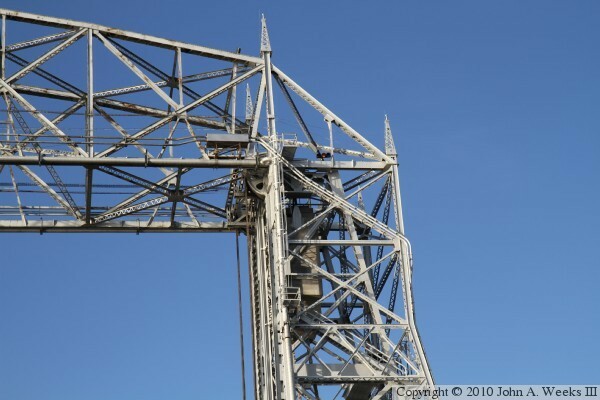 These two photos are early morning views of the east side of the Aerial Lift Bridge. The photo above shows the entire bridge, while the photo below is a closer view of the lift span. Both views are from south of the ship canal. 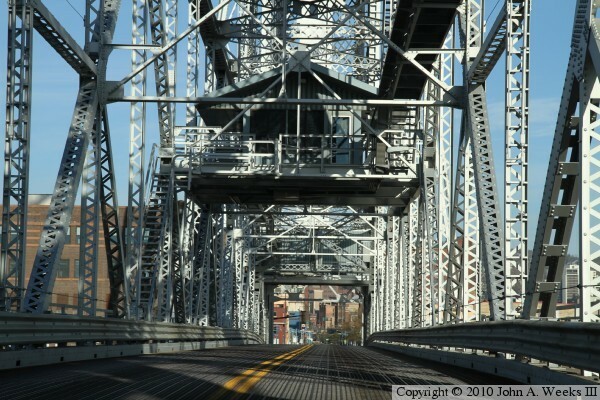 The photo above is looking north along Lake Avenue towards the south end of the Aerial Lift Bridge. 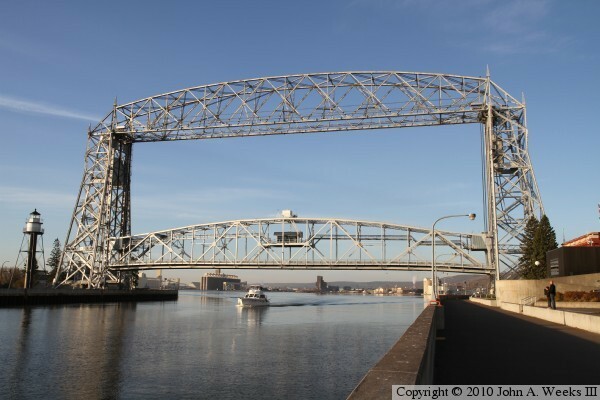 The photo below shows the lift span in a slightly raised position to allow a boat to exit the Twin Ports harbor and head into Lake Superior. The photo above shows a small boat passing under the lift bridge early on a cold autumn morning. 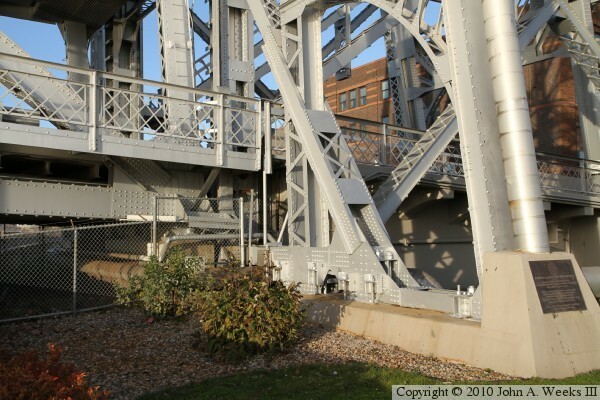 The photo below is looking west along the canal wall towards the east face of the Aerial Lift Bridge. The US Army Corps of Engineers building is located on the north side of the canal. 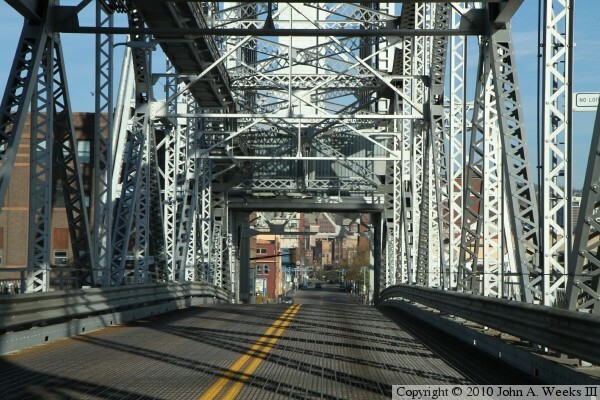 These two photos are the first of a six photo series showing a typical bridge crossing heading northbound. 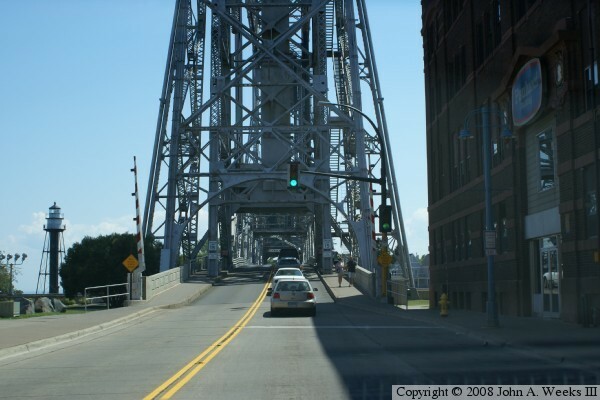 In the photo above, we are approaching the lift bridge from the south. 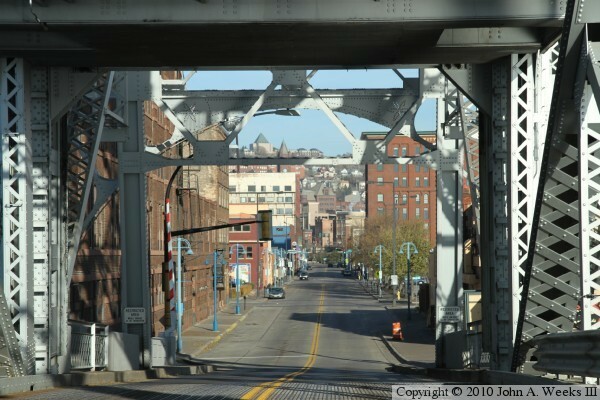 We are within a block of the bridge in the photo below, and we have the green light to continue across the bridge. 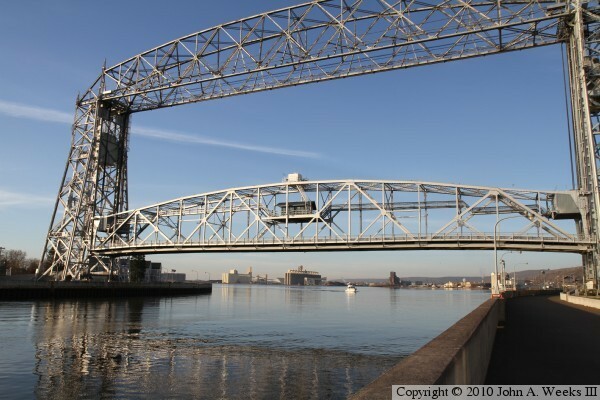 We are entering the south portal of the Aerial Lift Bridge in the photo above, while we are about one-third of the way across the lift span in the photo below. 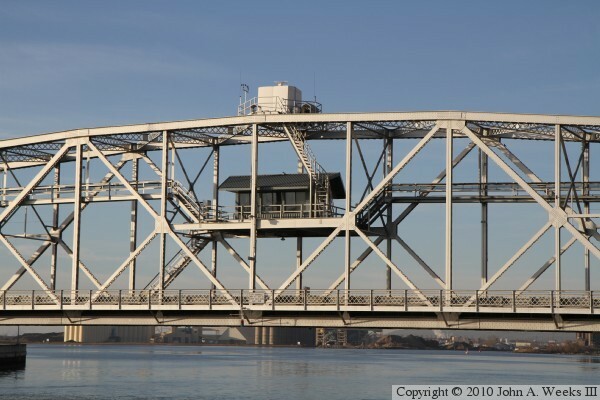 The bridge tender house is located above the roadway at the center of the lift span. The photo above is the half-way point in crossing the lift span. The photo below is exiting the north end of the structure. 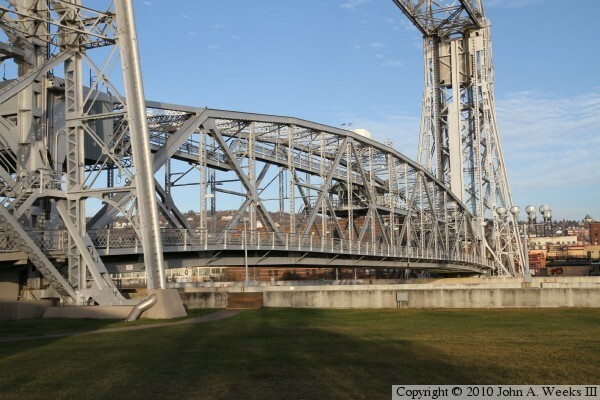 Canal Park is located on the north side of the Aerial Lift Bridge. The area is famous for many nice restaurants that are built in converted warehouses and factories. 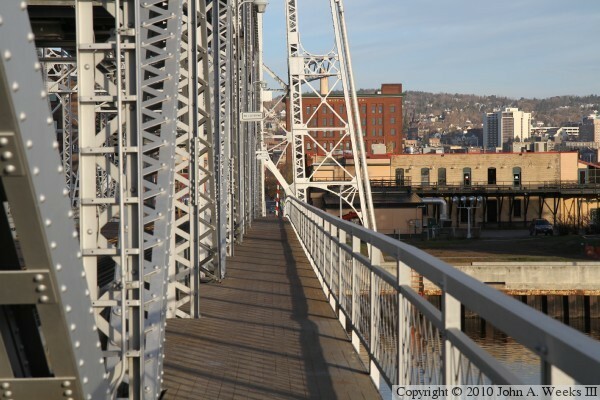 The photo above is a view looking north down the length of the sidewalk on the east side of the lift span. 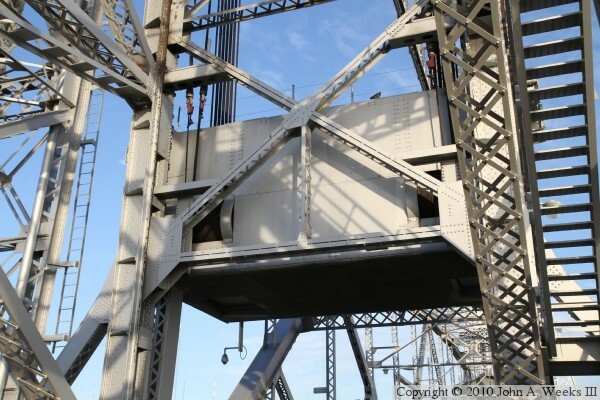 The photo below is a machine room located on top of the lift span on the south end of the movable bridge section. 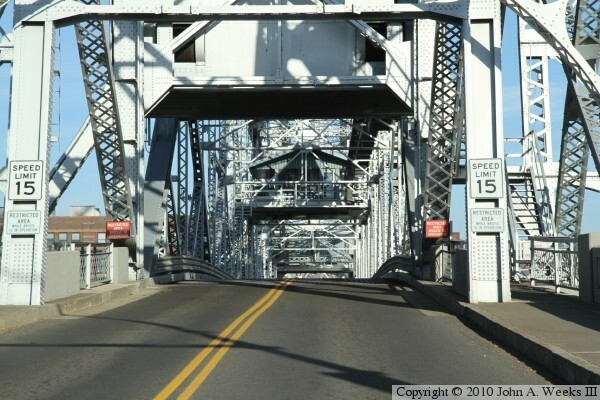 The photo above is a close view of the bridge tender house located just above the roadway. The photo below is the machine room at the north end of the lift span, also above the roadway. The photo above is a walkway and electrical cable chase that runs between the tender house and the machine room at the north end of the bridge. 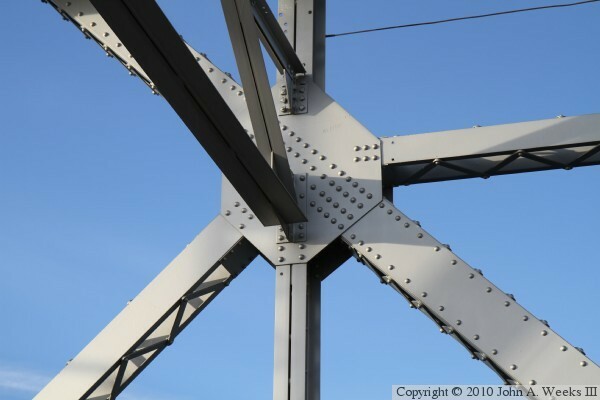 The photo below is a gusset plate that forms a connect between seven different bridge beams. The photo above is the east side of the north bridge tower. The lift span is on the left side of the photo, while the bridge approach is on the right side of the photo. The photo below is a close view of the steel marker attached to the bridge foundation. 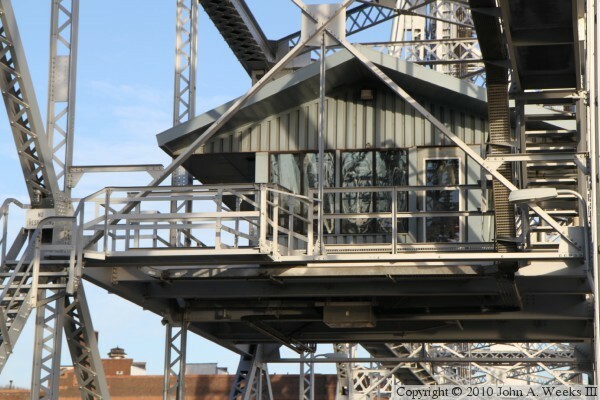 The photo above is a close view of the lift span, with the bridge tender house located at the center of the span. 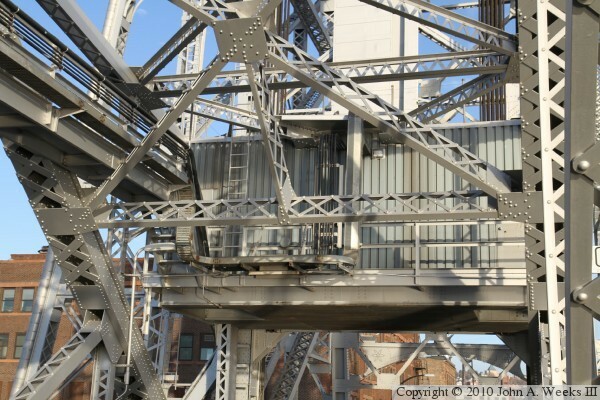 The photo below is a detail view of the pulley and counterweights at the north end of the structure. 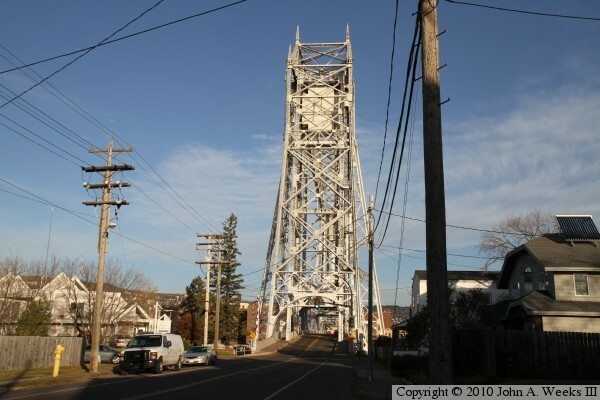 The local office of the US Army Corps of Engineers is located at the northeast corner of the Aerial Lift Bridge. The photo above is the newer east face of the structure that houses a museum and visitor center. 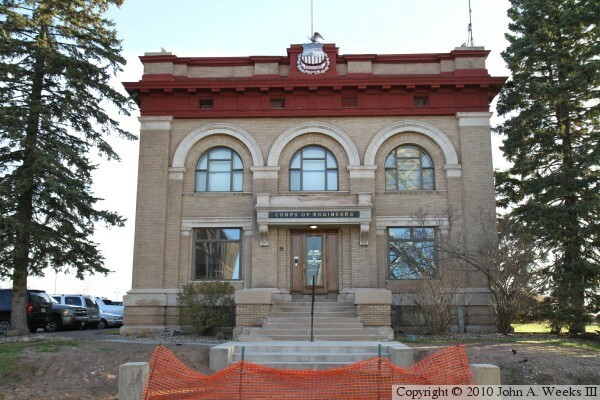 The photo below is the original west face of the building, which fronts along Lake Avenue.